The screening at the Egyptian Theatre last night of HOUSE OF WAX was a real treat. Not only was it my first opportunity to enjoy the 1953 film on a big screen - in 3D, as it was originally released - but actor Paul Picerni, who played the romantic lead, was there to speak briefly before the film, delivering several amusing anecdotes about the behind-the-scenes antics. Picerni began by joking, "It's hard to believe I played the young male lead - it's fifty years later, and I'm old and fat! : He added with a laugh, "But jolly!" Picerni recalled that the film - the first 3D feature from a major studio - was a huge box office success when it was released. 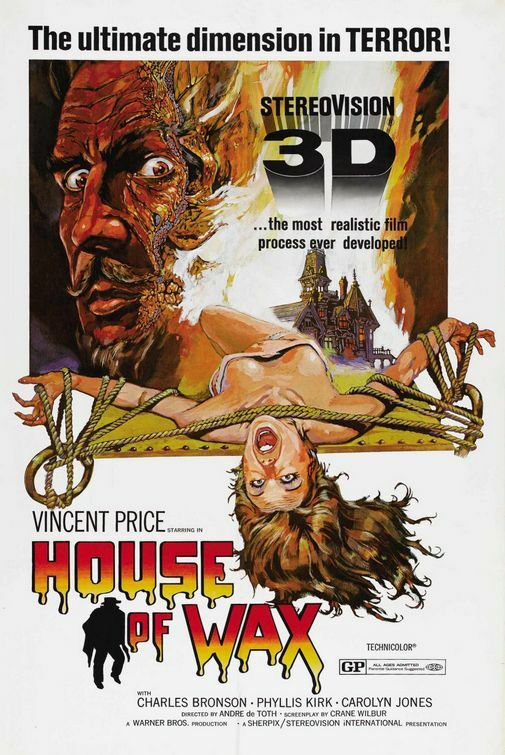 In the days before simultaneous release in thousands of theatres nationwide, HOUSE OF WAX had a series of premiers in major cities around the country. Picerni, a New York native, missed the Hollywood opening but was present for one in New York. In those days, the big movie palaces employed orchestras to perform before the movies on special occasions. In this case, Eddie Fisher was singing, and afterward he dedicated his performance to the man who gave him his break in the business, Eddie Kantor. Then the stars of the movie were introduced: Vincent Price, Frank Lovejoy, Phyllis Kirk, and finally Picerni. Picerni told the audience that, since Fisher had thanked the man who gave him his break, he himself wanted to thank the woman to whom he owed everything and asked his mother to stand and take a bow. After he left the stage, a studio publicist came up to Picerni and said, "That was a wonderful moment! Not a dry eye in the house! Do you think you could get your mother to come to the second show, too?" As for filming the movie, Picerni recalled no specific technical difficulties arising from the 3D process, which required a large rig consisting of two cameras strapped together (one to film an image for the right eye to see, one to film an image for the left eye to see). But he did say that director Andre de Toth's visual style caused him some headaches. In order to exploit the 3D element to maximu effect, DeToth shot most of the movie with wide angle lense and deep focus, emphasizing the depth of the screen. This meant that most of the acton had to be performed by the actual actors, even when the scenes called for fights or dangerous stunts that should have been performed by stunt man - the actors faces were going to be clearly visible, preventing any kind of substitution..
Picerni's big scene near the end involved a fight with Igor, the malveolent manservant played by Charles Bronsosn (then using the name Charles Bushinksi). "He was not a weight-lifter, but he was well-built from working in the coal mines," Picerni recalled. "And he was ugly! Perfect for the role. DeToth had him picking me up and slamming me on the floor; we were throwing chairs and axes at each other." In the scene, Igor eventually knocks Picerni's character out and puts his head in a guillotine that is part of the wax museum's chamber of horrors. Director DeToth wanted to film the following action in a single take: the police rush in, fight with Igor, subdue him, and remove Picerni's head from the guillotine - just before the blade falls. According to Picerni, he was concerned about the safety of the scene, because the guillotine was a real one. "I went to the cameraman and said, 'This is a gag, right? He doesn't plan to film all that in a single take.' But he was. I asked DeToth, 'How are you going to control the blade?' He said the property master was going to sit on top of the guillotine, holding the blade between his legs, then let it drop after my head was removed. I said that sounded dangerous, and DeToth said to me, 'What are you - a chickenshit?" While the shot was being set up, Picerni spoke to a stunt man, asking what he thought of the safety question. "He said the only way he would do it - and even then he would have to think about it - was if he had control of the blade. So I just stood there. I was under contract to Warner Brothers. I couldn't fight with the director, or I'd be fired and lose my contract, and I had a wife with a baby on the way. When they called 'places,' the other actors took their places, but I didn't move. DeToth said, "Picerni, put your head in the guillotine.' I said I wouldn't do it the way he was planning. He yelled at me, "Picerni, put your head in the guillotine, you goddamned coward!' I said to him, in a way that Brando might have, 'If you ever call me a coward again, I'll kill you!' That was the New York Dago in me coming out." Picerni found himself suspended, but a few days later a representative from the studio came to ask him to return. 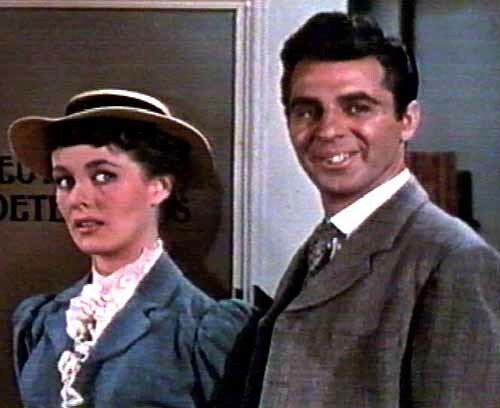 The only condition was that Andre DeToth wanted Picerni to agree to film the scene as planned. Picerni again refused. Then the studio contacted him again. This time, DeToth agreed to have a metal bar, suspended like a parallel bar, inserted beneath the guillotine blade. After Picerni's head was removed from the wooden block, the bar would slide out, allowing the blade to drop. The epilogue to the story is that, a year later, Picerni was offered a small part in a Randolph Scott Western, Much to his surprised, the film was being directed by DeToth. Picerni read the script and saw that his character was riding shotgun on a stage coach that - on page 3 - went over a cliff! "That was Andre De Toth's revenge," Picerni quipped." "When I see someone approaching whose name I don't remember," Price explained, "I just extend my hand and say, 'Vincent Price.' Inevitably, the other person takes my hand, and says his own name." Picerni recalled that, as if on cue, Price saw a familiar face approaching him. Price stood, extended his hand, and said, "Vincent Price." The other man - apparently an actor - said, "You don't need to tell me your name - I've killed you in three films." To this day, Picerni says he has never learned the name of that other actor. So much for the prelude. What of the film? I've never been a big fan of HOUSE OF WAX, because I thought its colorful photography was too pretty to generate much fear, and the visual style dicated by the 3D element never worked well when viewed in 2D on television or home video. But I have to admit that, on the big screen, the movie is quite a revelation. Andre De Toth uses the three-dimensions to put the audience into the film, and the wax museum setting is a pefect one - you can practically feel the atmopshere of the place. Of course, the movie is filled with inventive, sometimes gratuitious 3D gags: at one point, a man swats a paddle ball out of the screen at us while luring passersby into the wax museum like a carnival barker; later, Igor abruptly rises into the frame and rushes at the hero, creating the momentary illusion that someone in the seat in front of you has suddenly leap up and onto the screen. But the real appeal of the film's 3D is the illusion of depth, which emerged nicely in the reasonably well-preseved print screened at the Egyptian Theatre. There are fewer closeups and less intercutting than in many movies, but the long takes and deep focus does make you feel as if you are looking into a world that really exists in the screen. Especially alarming are some of the stunts - not just the aforementioned guillotine gag but Price's run through a burning wax museum at the beginning, racing under a balcony that collapses literally a second after he has gone through. The effect is breath-taking in its conviction: you almost feel the flames, and the clarity of image and depth reveals that this was no stuntman but the actual actor a mere second away from serious imagery. This wonderful sense of credibility, even amidst a fanciful melodrama, lends the movie an air of conviction that is sadly lacking from many recent horror films, especially the rather nasty 2005 remake, which replaced the relative realism with an excess of CGI that turned the movie into nothing more than a dull special effects show. Read our House of Wax retrospective.